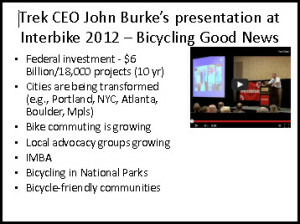 Home > Advocacy > John Burke’s BHAG: 5% of trips by bike by 2025. What about mountain biking? John Burke’s BHAG: 5% of trips by bike by 2025. What about mountain biking? Trek Bikes currently has four company bloggers (see the Trek Life section of their website) and one of them is A Great Ride by John Burke, Trek president. He’s a pretty good blogger and tweets at @JBTrek08 regularly, too. This week I had the honor of addressing the attendees at Interbike. I wanted to talk about the good and the bad news and the “state of the union” about what’s going on in bicycle advocacy. It was an awesome group of people capable of doing great things. Remember, the world is run by those who show up! It’s an informative and inspiring presentation. I like his BHAG (big, hairy, audacious goal) of 5% of trips by bike by 2025. But I think there needs to be a different metric to go along with it that involves mountain biking. Hmmm. Any ideas out there? In the meantime, watch the video. I’ll add some notes from his presentation when I get a chance. I typed up my notes on Burke’s presentation a while ago but lost track of them. Duh. Found ’em today. See the PDF added to the bottom of the blog post above.